Markarian 1018 is an "active galaxy" that has brightened and dimmed over about 30 years. Such shifting between bright and dim phases has never been studied before in such detail. By combining data from Chandra, VLT and several other telescopes, scientists have narrowed in on the explanation. It appears the dimming arises from the black hole at the center being deprived of enough fuel to illuminate its surroundings. Astronomers may have solved the mystery of the peculiar volatile behavior of a supermassive black hole at the center of a galaxy. Combined data from NASA's Chandra X-ray Observatory and other observatories suggest that the black hole is no longer being fed enough fuel to make its surroundings shine brightly. Many galaxies have an extremely bright core, or nucleus, powered by material falling toward a supermassive black hole. These so-called "active galactic nuclei" or AGN, are some of the brightest objects in the Universe. Astronomers classify AGN into two main types based on the properties of the light they emit. 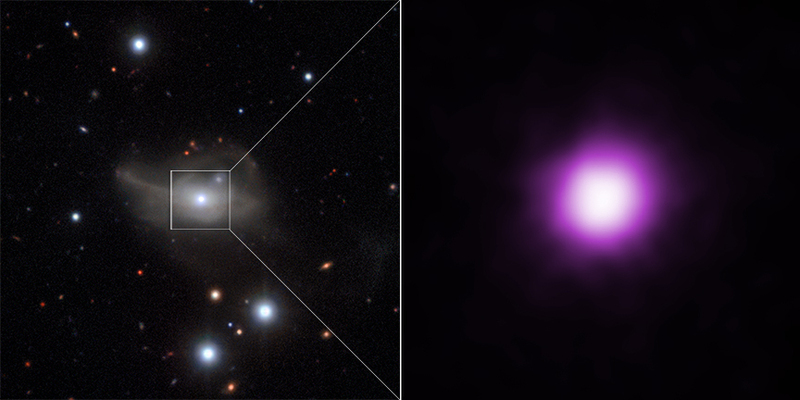 One type of AGN tends to be brighter than the other. The brightness is generally thought to depend on either or both of two factors: the AGN could be obscured by surrounding gas and dust, or it could be intrinsically dim because the rate of feeding of the supermassive black hole is low. Some AGN have been observed to change once between these two types over the course of only 10 years, a blink of an eye in astronomical terms. However, the AGN associated with the galaxy Markarian 1018 stands out by changing type twice, from a faint to a bright AGN in the 1980s and then changing back to a faint AGN within the last five years. A handful of AGN have been observed to make this full-cycle change, but never before has one been studied in such detail. During the second change in type the Markarian 1018 AGN became eight times fainter in X-rays between 2010 and 2016. After discovering the AGN's fickle nature during a survey project using ESO's Very Large Telescope (VLT), astronomers requested and received time to observe it with both NASA's Chandra X-ray Observatory and Hubble Space Telescope. 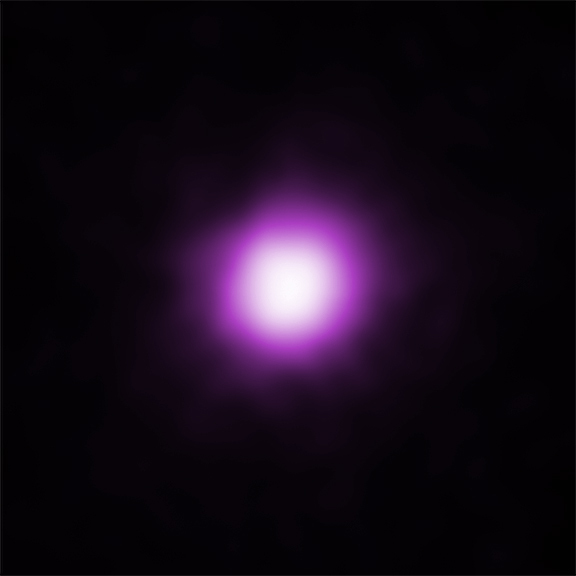 The accompanying graphic shows the AGN in optical light from the VLT (left) with a Chandra image of the galaxy's central region in X-rays showing the point source for the AGN (right). Data from ground-based telescopes including the VLT allowed the researchers to rule out a scenario in which the increase in the brightness of the AGN was caused by the black hole disrupting and consuming a single star. The VLT data also cast doubt on the possibility that changes in obscuration by intervening gas cause changes in the brightness of the AGN. However, the true mechanism responsible for the AGN's surprising variation remained a mystery until Chandra and Hubble data was analyzed. Chandra observations in 2010 and 2016 conclusively showed that obscuration by intervening gas was not responsible for the decline in brightness. Instead, models of the optical and ultraviolet light detected by Hubble, NASA's Galaxy Evolution Explorer (GALEX) and the Sloan Digital Sky Survey in the bright and faint states showed that the AGN had faded because the black hole was being starved of infalling material. This starvation also explains the fading of the AGN in X-rays. One possible explanation for this starvation is that the inflow of fuel is being disrupted. This disruption could be caused by interactions with a second supermassive black hole in the system. A black hole binary is possible as the galaxy is the product of a collision and merger between two large galaxies, each of which likely contained a supermassive black hole in its center. The list observatories used in this finding also include NASA's Nuclear Spectroscopic Telescope Array (NuSTAR) mission and Swift spacecraft. Two papers, one with the first author of Bernd Husemann (previously at ESO and currently at the Max Planck Institute for Astronomy) and the other with Rebecca McElroy (University of Sydney), describing these results appeared in the September 2016 issue of Astronomy & Astrophysics journal. Coordinates (J2000) RA 02h 06m 15.99s | Dec 00° 17´ 29.20"
Observation Time 13 hours 53 min. If there are - or were - two black holes as the result of the collision of two galaxies, how long would they remain in orbit? Wouldn't the orbits decay fairly quickly as a result of gravitational wave radiation leaking orbital energy away? An active galaxy located about 590 million light years from Earth. X-rays from the Chandra X-ray Observatory with optical data from ESO's Very Large Telescope. X-rays are purple, optical are red, green and blue.